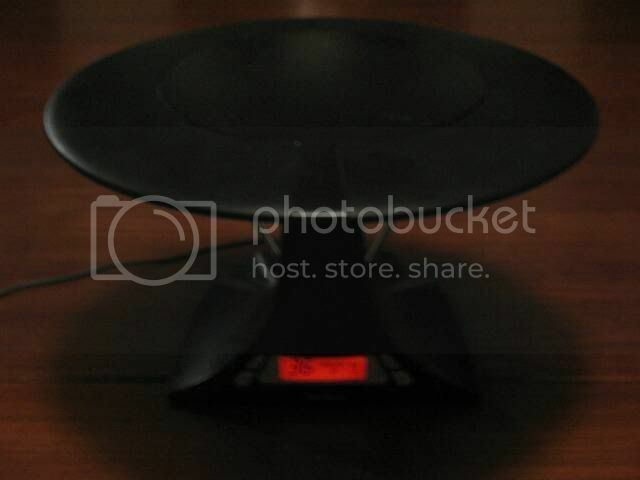 Welcome to EV's Indoor Antenna Round-Up! The Ultimate Internet Guide to Indoor Antennas! These antennas are listed in no particular order. This list of antennas are all recommended and better than average. 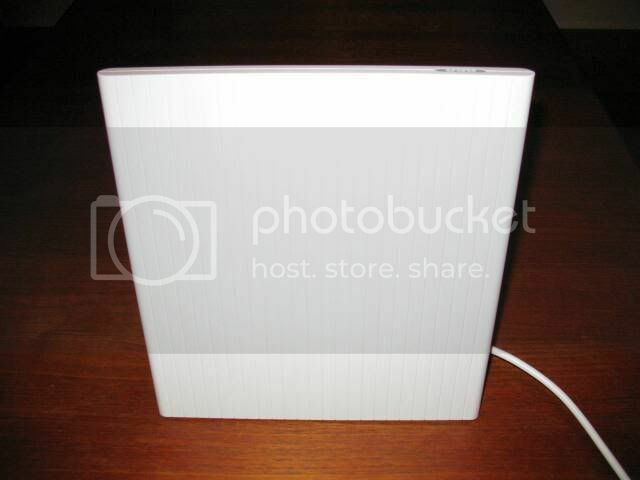 There is no one best indoor antenna. Environmental factors present a plethora of situations that no one antenna can be best for all of them. 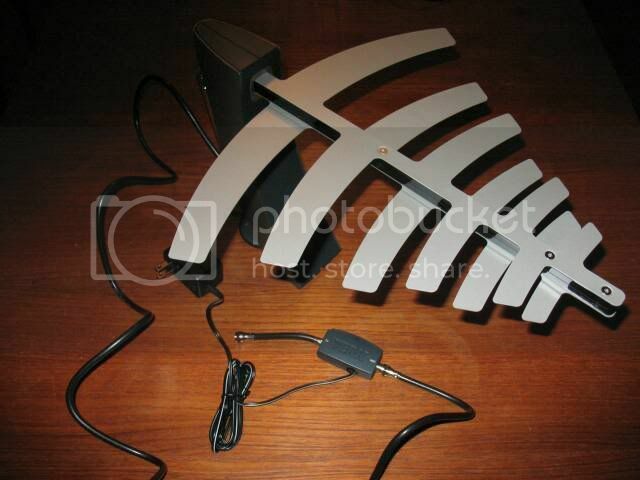 In fact, most times the best indoor antenna is an antenna placed outdoors or an outdoor antenna placed indoors. Some may need VHF Hi and UHF, others only UHF, after the Feb2009 shutdown of analog broadcasts. Antennas are a strange brew, sometimes it's more of an art than a science, and while these are generally well regarded antennas for indoor use, Your Mileage May Vary. Remember, outdoor placement is much preferred if you can swing it. Even if you get some of these outdoor antennas that are small, flat, and aesthetic and unobtrusive enough to go inside, they will do better outside on a patio or outside a window especially if facing the broadcast tower cluster. Some even put large antennas in attics. The other end of the equation is tuner ability, sensitivity and selectivity. ATSC tuners have dramatically improved over the last couple of years. If you are on the fringe of reception even using the best antenna setups, you may want to consider improving your tuner with a set top box tuner. Both SD Coupon Elligible Converter Boxes and HDTV Tuner Boxes exist. LG and Samsung make great HDTV tuner boxes. LG makes some of the best tuners, and their CECB the Zenith DTT901 currently has one of the most sensitive tuners for those looking to keep using their old CRT NTSC analog sets. You can research tuners and converter boxes in the same subforum that you are now located in AVSforum. Please feel free to add your comments, suggestions, observations, corrections, experiences, questions, etc. They are most welcome. I am not an expert or highly trained and experienced technician, just an amateur enthusiast. I do not portend to be anything else. There are many other people on this site that are much more knowledgable and experienced than I. Special thanks to Seatacboy, golinux, fajitamosaic, Rick313, Rammitinski, and deltaguy, for their encoragement, enthusiasm, guidance and contributions.....and to KenH for making this thread a sticky. Newbies start here! Read this first! Federal law requires that all full-power television broadcast stations stop broadcasting in analog format and broadcast only in digital format after February 17, 2009. Broadcast stations in all U.S. markets are currently broadcasting in both analog and digital. If you have one or more analog televisions that receive free over-the-air television programming with an outdoor antenna or "rabbit ears" on the TV, you will either need a digital television (a TV with a built in digital tuner) or an analog television connected to a "digital-to-analog converter box" (which converts digital signals to analog signals for viewing on your analog set) in order to continue to watch programming from full-power broadcast stations. This Fact Sheet provides information on antennas and on what is needed for good quality reception of digital broadcasts. First, it is important to know that if your television currently receives good quality reception on analog channels 2-51 with a broadcast antenna, it should be able to receive digital television (DTV) signals, including high definition television (HDTV) signals, with the same broadcast antenna. 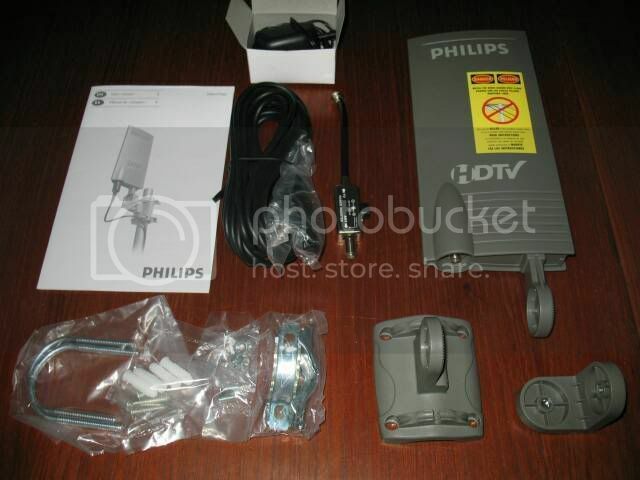 You do not need to purchase a "DTV antenna" or an "HDTV antenna" to receive DTV or HDTV signals. However, consumers should be aware that if they use a digital-to-analog converter box, they will still need to use an antenna to receive DTV signals. Prior to making any changes to your current antenna or antenna system, you should check to see if it will receive the digital signals being broadcast in your area. 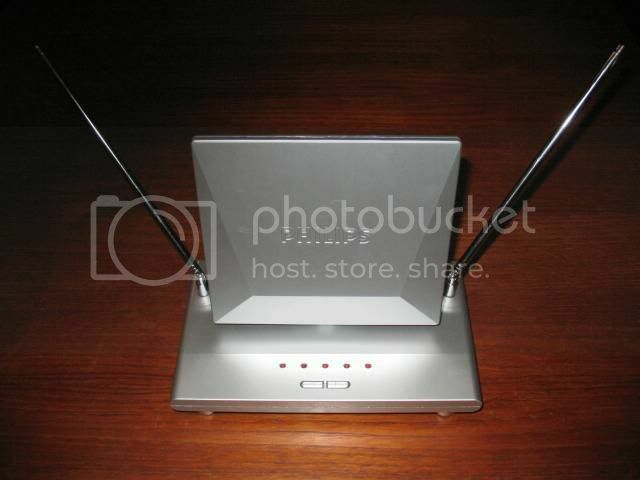 Connect your existing antenna to either a digital television or a digital-to-analog converter box connected to an analog TV. Make sure your TV is set up to receive over-the-air broadcasts (as opposed to being connected to a paid provider such as a cable or satellite TV company). It may also be helpful to perform a "channel scan," in which your TV will automatically check to see which stations it can receive. In many cases, this is all you will need to do to watch digital television broadcasts. If you experience reception problems, the following information and tips may help to improve your reception for digital broadcasts. During the transition to digital TV, many stations are temporarily operating at reduced power levels. If you are not receiving certain digital TV stations, this does not necessarily mean there is a problem with your antenna or receiver. Check with the TV station to find out whether they are planning changes that will improve reception. When an analog TV signal is weak or receives interference, static, snow, and distortion will often appear on the screen, but you can watch the picture through the noise. Digital broadcasting will provide a clear picture even with a weak signal and in the presence of interference. However, if the digital signal falls below a certain minimum strength, the picture can suddenly disappear. This “cliff effect” means that if you typically watch analog TV stations that have a lot of static and distortion, you may have to adjust or upgrade your antenna system to get a reliably good signal for digital broadcasts. TV reception can be affected by factors such as terrain, trees, buildings, the weather (rain, wind, humidity), and damaged/deteriorated equipment. Often digital reception can be improved just by changing the location of your current antenna. Moving it away from other objects and structures, or placing it higher can often improve reception. Many antennas need to be oriented or aimed to get the best signal from the desired station. For indoor antennas, you may need to do this manually by trial and error. 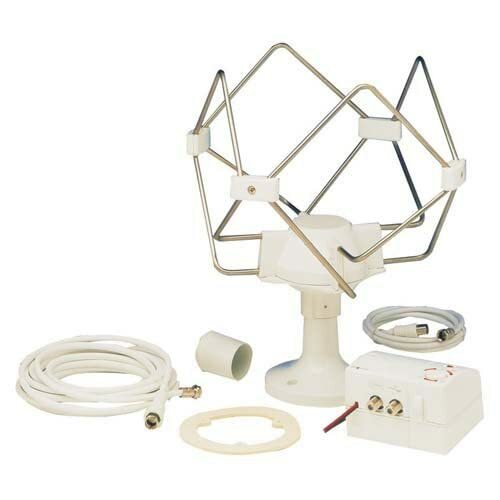 For outdoor antennas, a rotor that re-orients the antenna can improve performance, particularly when trying to receive stations that transmit from different locations. Simple indoor antennas, such as rabbit ears, provide minimal performance that may or may not be suitable for your location. 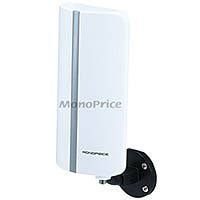 If you are unable to obtain satisfactory reception with your current indoor antenna, you may wish to obtain an indoor antenna that includes features for better reception of UHF signals and/or an amplifier to boost the received signal (often referred to as an active indoor antenna). 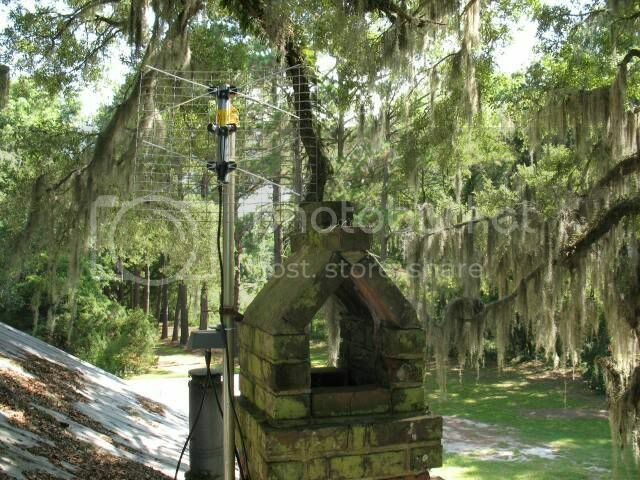 Generally, an outdoor antenna will get better reception than an indoor antenna. If you already have an outdoor antenna and are getting good quality reception from VHF and UHF channels, your antenna should work fine for digital television. The performance of outdoor antennas can degrade over time due to exposure to the weather. If you are having problems, check for loose or corroded wiring, broken antenna elements and that the antenna is pointed in the right direction. Try to keep the length of wire between your antenna and digital receiver as short as possible for best reception. You can use a single antenna to provide digital broadcasts to multiple TVs in your home. Remember, however, that each analog TV connected to your antenna will need its own digital-to-analog converter box to view digital broadcast programming. "Splitters" that are used to connect a single antenna to multiple receivers reduce the amount of signal available to each receiver. If you are having problems, check to see whether reception is improved without the splitter. In some cases an "active" splitter that includes an amplifier can solve the problem. If you are near a station's broadcast tower, reception of that station, as well as other stations, can be impeded by signal "overload". Consider using an "attenuator" or removing amplifiers to improve your reception. If you decide to replace or upgrade your outdoor antenna, websites such as www.antennaweb.org and http://tvfool.com/ provide information on the locations of broadcast towers and the types of outdoor antennas appropriate for the stations you wish to receive. If you need assistance with upgrading your antenna system, check with a local antenna retailer or antenna installer. Outdoors is better than indoors. Bigger is better than smaller. Directional is better than omnidirectional. Mounting higher is better than mounting lower. These are rough guestimations, based on my personal observations. They have not been instrument tested yet. Just because something is at the top of the list, does not necessarily mean that it is the best antenna for you and your particular situation. You may be best served by an unamplified model or an omnidirectional model, and directional and amplified units tend to do better on net gain and distance measures. This list is also most certainly distorted by varying atmospheric conditions. I will address that by instrument testing these all on one day, so as to minimize human and atmospheric error. Here is a chart designed by wwong incorporating the data that I collected in regards to antenna performance using a Zenith 901 Converter Box. Note the first 2 entries were tested on a seperate day, I was testing the Clearstream2 and used the DB2 as a control to help integrate the information into the above lists. schowtyme, wtfer and jujujulia like this.
. c. Radio Shack 15-1892 "The UFO"
. c. Digital Dude Video: Antenna Myths Dispelled! Believe it or not, these are pretty darn good antennas. The Rabbit Ears give you good VHF performance, and the basic loop gives you good UHF. These outperform many fancy looking and more expensive Amplified RE & Loops. If you have a pair of these around, you should pull them out and give them a try. They may be all that you need. Indeed they may be the best solution. Note that those close to the towers can overload their tuners with already strong signals that are then amplified. This wont hurt your tuner/TV(but you shouldnt keep abusing it), but they just wont work. Some of the best currently available basic RE & Loops from mine and others experience and testing are the RCA ANT110 and the RCA ANT108. These are virtual clones and Ive seen these same units with other brand names on them as well. These are easy to find at major B&M retailers nationwide. The RCA ANT108 is pictured. They have strong thick 5" loops and 39" telescoping rabbit ear dipoles that are sturdy and simple to adjust. On the downside, they have thinly shielded coax that is not detachable. However, they do perform and are dirt cheap. The RS Delta has pleasing aesthetics and good user reviews. Plus fine tuning adjustment knob. Good performer for non amplified RE & Loops. This unit has detachable coax and telescoping rabbit ear dipoles that are adjustable in altitude and azimuth. If you dont like the utilitarian looks of the basic models above, this one works well also. Nice little antenna. VHF and UHF. Delta design for a high-tech look. Use the UHF/VHF/FM indoor antenna with 12-position fine-tuning control to dial in the clearest picture for each station. 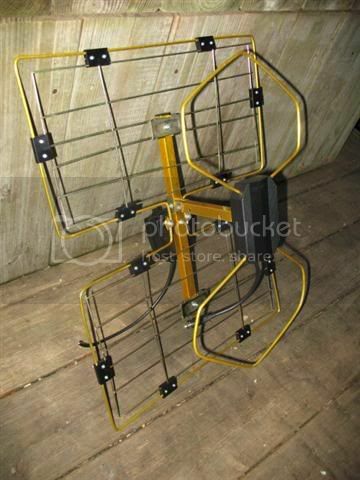 The unique delta design of this set-top antenna makes it an attractive addition to your viewing room. It has gold plating and 75-ohm VHF/UHF output. The internal loop UHF loop is 39" with black chrome and VHF dipoles. This antenna comes with a 6-ft 75-ohm coaxial cable with gold-plated connectors. Here is Terk's version of the non-amplified basic Rabbit Ears. It has good build quality and nice modern aesthetics, plus 44" VHF dipoles. It comes with a sepereate UHF loop which is not attachable as an integrated UHF/VHF antenna solution. Its made to attach to the back of an old TV and thusly isnt very useful. But it can be used in conjunction with a superior UHF only antenna as many are in this list. If you need to add a VHF Hi antenna after the Feb09 cutoff of analog signals, this is a good choice. In order to join 2 seperate UHF and VHF antennas, you need a VHF/UHF Combiner. Its worth the effort to use a Combiner and not just a basic Splitter for less signal loss and better signal filtering and handling. Channel Master and Winegard offer combiners but you can get the cheapies and they are still better than the basic splitter. An AVSforum member explains this setup. ...... I am in a heavily wooded area (and in a hollow to boot) about 26 miles from the towers. My location has been described as a "worst case scenario". I have been using a DB2 with a 22db amp in an indoor window for several years. Since there is a VHF station, I have rabbit ears and the DB2 hooked to a signal combiner before going to the amp. This setup picks up all the local stations in analog and also with the Zenith DTT900 converter box. On two of the weaker stations there is some minor dropout if the winds are heavy but nothing I can't live with. 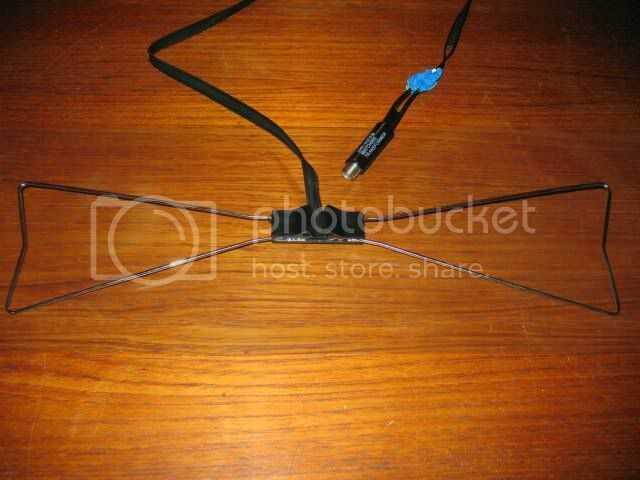 One of the best of the ubiquitous Amplified Rabbit Ears and Loop style set top antennas, which arent the best performers in general as distance antennas, but may suit your needs best. It doesnt have a loop per se, but a "UHF flat panel array." It is also amplified, 50db overkill(I'm skeptical of that figure), but adjustable and has nice 44" dipoles for VHF reception. Strangely it includes a 75ohm to 300ohm transformer/balun along with a nice guide booklet. Has a detachable coax interface, plus an Aux input with a switch so that you can choose between the antenna or another source. 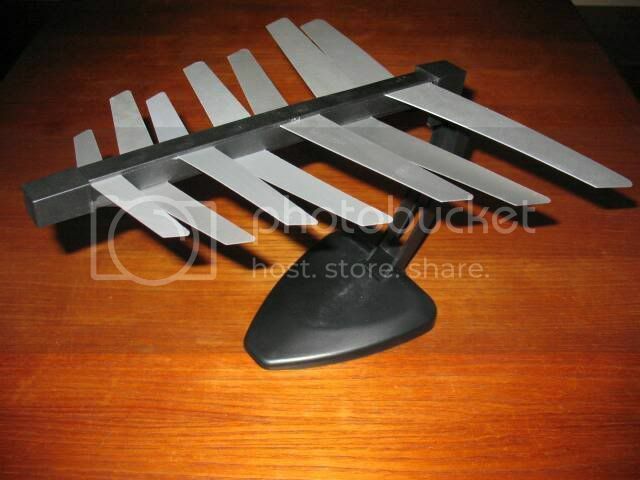 Doesnt have an FM trap, so can be used as an FM antenna as well. One thing to note, is that this is a directional antenna, loops are omni-directional or more precisely bi-directional....and is adjustable in altitude and azimuth. The build quality is good on these, the base is weighty and stable and it sits off of the surface. VHF and UHF. If you are close to the towers, this highly amplified version may not be for you, although the amp is adjustable like most other amped RE & Loop combo antennas, you may want to try an unamplified version first. Overamplifying strong signals can overload the tuner and you might recieve no stations at all. Overloading will not damage the tuner though, it just wont work. When reading user reviews, often the ultra low scores are by people that get no signals because of this amplifier gain overloading business, unbeknownst to them. In depth comparative reviews of this and other antennas can be found on the Big River MANT510 page. 44" dipoles adjust 360° with a 180° tilt to deliver the best possible reception. Together with the adjustable amplification, low noise amplification ensures you of a great reception range and improves and maintains the quality of your signal. Easy touch control with LED signal increases or decreases amplification strength. Also confirms amplification strength at a glance. A/B switch - Built-in selector switch makes it easy to change between viewing sources. Simple sleek, elegant design lines compliment today's new TVs. I really like these antennas. They are excellent performers and are the best of the amplified Rabbit Ears & Loop style antennas. They can be found at major online retailers for dirt cheap as well. The large 9" loop (which is also particularly thick) is the key. It shifts the meat of the gain curve down into the newly re-allocated UHF TV spectrum of Ch. 14 to 51....for superior performance over all others with smaller loops. The amplifier helps as well, if you need the extra umph. Also has Rabbit Ear VHF dipoles for adequate VHF reception. Amplified....UHF and VHF. This is my new favorite unamplified RE&Loop. Its main claim to fame is that it has a larger 7.5" diameter loop which pushes the gain curve down into the heart of the newly squashed UHF Digital TV spectrum (really it could be even larger like the 9" loop on the Petra SuperPower above that is a very good performer). The RCA ANT108 and others like it have a 6.5" diameter loop. UHF and VHF. Highly Recommended. The Quantum FX ANT-102 performs on par with the legendary RS-1880. As you can see they are similarly sized and designed with amplified double loops plus telescoping articulating Rabbit Ear VHF dipoles. 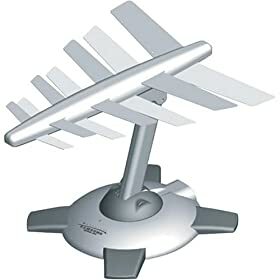 The Q FX ANT-102 includes a remotely controlled light duty rotor that works well....can be useful for people with multiple direction transmissions....however even if you dont need this feature, this antenna is one of the elite indoor antennas in current distributino (along with the Silver Sensor, and Terk HDTVa, RS 1892 UFO). Snap one of these up, youll be glad you did. Recommended. UHF and VHF. The Lava A-463 is also a good antenna similar to the lengendary RS 1880, with amplified double loops and telescoping articulating Rabbit Ear VHF dipoles. However it is smaller, as can be seen in the pic. The Lava A-463 is nearly as good as the RS 1880, beating everthing else in this category except the Q FX ANT-102. I think the Lava gives up something on the lower channels of the UHF band due to its diminuative size to both the ANT-102 and the RS 1880. However, this is not a bad antenna, and is better than any Amplified RE&Single Loop style antenna which is so common. Its just the Q FX ANT-102 is slightly more desirable. UHF and VHF. Believe it or not, this is a pretty darn good UHF antenna! It will beat most RE & Loops on UHF. And best of all, its dirt cheap. Can be found at Radio Shack and there version has plastic clips for securing the antenna to a Rabbit Ear dipole or wire. 13" long x 3 1/4" wide, bi-directional(omni). Give this one a try, for sure. You will need a 300ohm to 75ohm balun. UHF only. This is a clone of the famous RS Double Bow Tie. It is an excellent performer. It is approximately 12" square x 3" deep. Its screen gives it nice directional forward gain on UHF. No VHF performance to speak of. The bows are fairly easy to bend so be careful. It has a twin lead to 300ohm spade cable...so you will need a matching transformer balun. However, you may be able to improve the performance of this one by removing the twinlead and adding the matching transformer balun directly to the feedlines. Another home improvement technique is extending the bowties with aluminum foil. UHF only. 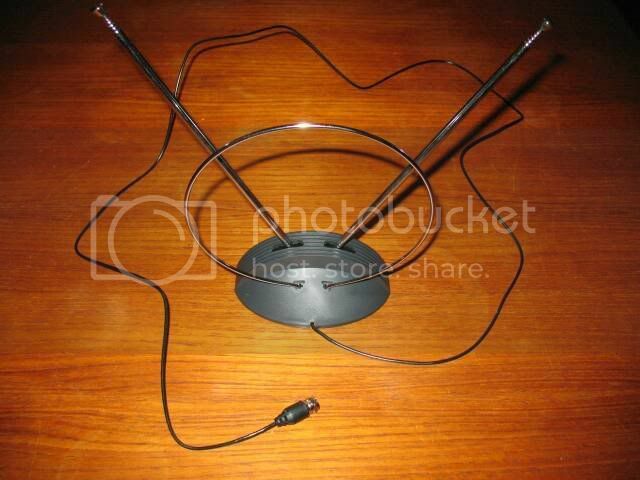 Superior antenna for use indoors. Technically not an indoor antenna. This one is small enough and not too aesthetically unpleasing to do indoor duties in tough situations. Can also be mounted on small patios or outside windows for apartment dwellers. Not amplified, but an external can be added if necessary. Excellent performance among indoor antennas(better outside of course). Ive currently got this one on the roof with a Channel Master Titan 7777 amplifier and its holding its own against an xg91 that it temporarily replaced(yes I have serious tree and placement problems) 45 miles South of the towers. UHF only. New for 2008! New Low-loss Design. The Eagle Aspen version is virtually identical to the DB2 and can be found for a significantly lower price at major retailers online. Paper Towel Holder - the kind with the wood dowel that stand vertical from a wood base. This is basically a DB2 with an "attractive" plastic housing which can be useful in Homeowners Association situations. Expect similar if slightly diminished from the plain DB2 performance. It comes in 2 flavors, amplified or unamplified. UHF Only. 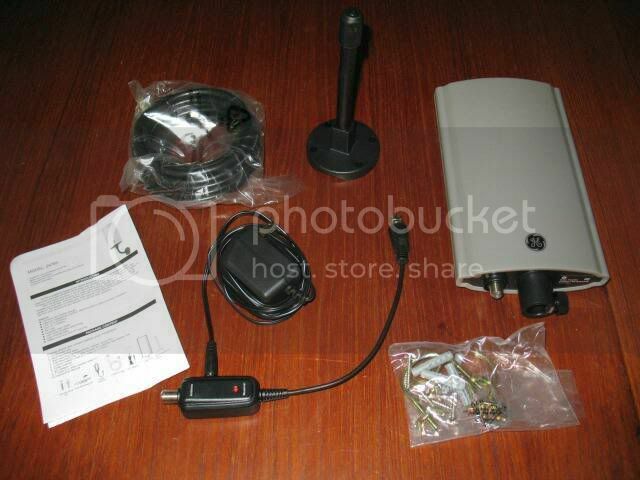 Includes all you need: Lacrosse Antenna, 17dBamplifier, J Mount Bracket, Mounting Hardware, Quad-Shield Coax Cables. Receive uncompressed, over-the-air HDTV signals from local affiliates. Build to blend intot he design of your home. Similar to the DB2, expect similar excellent performance. The 4220 is probably a bit better than the DB2 because of its larger bows. Note however that the CM 4220 is quite a bit larger than the DB2, including depth, plus its a bit heavier than the DB2......making the DB2 perhaps more suited as an indoor antenna, since performance is similar. I replaced the DB2 on the roof(which replaced the xg91) and it performed admirably, perhaps a tad better than the DB2 on signal strength. The build quality of this unit is commendable. Galvanized steel whiskers, feedlines, and sub-mast, galvanized steel heavy duty powder coated reflector, and yellow chromated steel mounting hardware, plus a bit of plastic. UHF only. 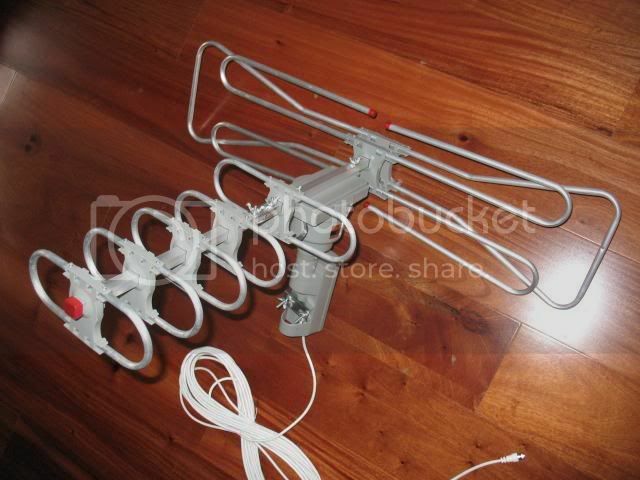 Update: These USA made antennas have been discontinued and replaced with Chinese made HD series antennas (4220HD, 4221HD, etc). I recommend the Antennas Direct (Terrestrial Digital) DB series antennas (DB2, DB4, etc) over these new Chinese made Channel Master double bowties. Although they are made in China as well, the build quality is better on the DB series. The DB2 has nice thick aluminum whiskers and a superior quality reflector. • Turning radius of 10 in. 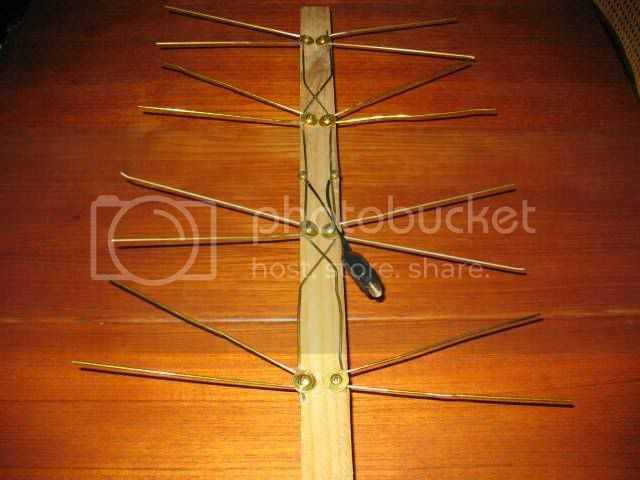 If you are really desperate, then you may consider the Channel Master 4221, quad bow tie as an indoor antenna. Prime candidate for an attic or closet install. Its the smallest, most compact with the least number of sharp protrusions of the commercially available quads. UHF only, but does give you some VHF Hi gain. Or you can try to build your own. These are inexpensive to make from common materials, but are good to excellent performers depending on the skill of the maker. You can build one without a reflector to save space and mount them in out of the way places. Even add an amplifier to boost performance so you can shove it in the closet or mount it in an attic. UHF only. The pic is of My First Attempt at a Homemade Coat Hanger Quad Bow Tie, Youtube Video Specifications. I knocked one of the whiskers out of position. It can be adjusted simply. 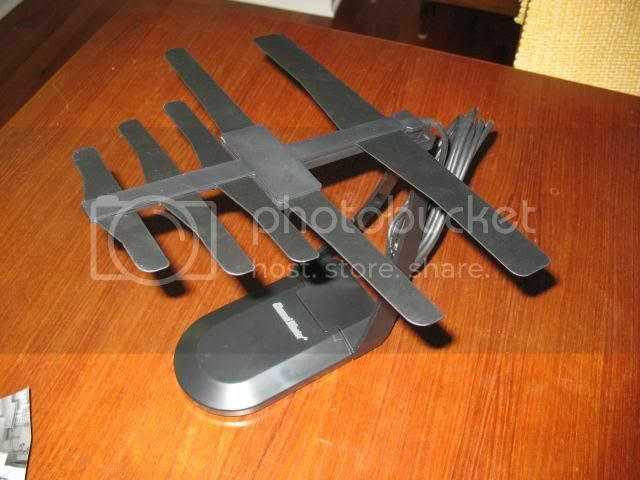 Youtube Video: Coat Hanger HDTV Antenna! There is also an active topic discussing improvements and techniques here on the AVSforum. Here is a video produced by AVSforum member jwwm_2, of the improved design of the 4 bay advanced and tested by AVSforum mclapp on the How to build a UHF antenna thread. This desian uses wider spacing and longer elements to increase gain in the heart of the newly shrunken TV UHF band spectrum, and also has gain on UHF High. Much improved version of the 4 bay bowtie. There is a great comparison between this design and the famous Youtube Coathanger Antenna right at the beginning. These style antennas are especially good at multipath or interfence rejection, because of there tight beamwidths aka very directional nature. Airport/airplane noise, multipath in big cities from buildings, etc. The famous original Silver Sensor. Lots of different brandings on this one. Looks more like a sculpture, but it works well, very directional though, not best if you are in the middle of several towers in different directions. May have to fuss with it too much for your liking. Also, it's a bit tippy. Still offers excellent performance for a small indoor antenna. Non Amped.....but you can add an amplifier and make this one even better. UHF only. Addendum: The build quality of these is often criticized. Probably partially due to its propensity to tip over(instability), but also fit and finish. Terk here offers 2 good antennas which are Silver Sensor style log periodic antennas, but not exact clones. They are very good performers and highly directional. These offer the advantage of Rabbit Ears which are attached at the base of the unit, thus offering VHF reception. The rabbit ears have a limited range of motion because of the way they are attached to the base. The HDTVi version is un-amped, the HDTVa version contains an internal amplifier. The amped version give you more gain, and I think an unamped Rabbit Ears and Loop, would be more desireable in cases where the unamped version would more likely best fit. However the directionality of its UHF design can be useful where multi-path is a problem and amplification would overload the tuner, like big cities with lots of high rises. These units are a little tippy like the Silver Sensor but a little more stable as they have more mass in the base, but the base is not as wide and the rabbit ears complicates matters further. Like the original Silver Sensor, you may have to fuss with it too much for your liking, or it could be the perfect antenna to deal with multipath. VHF and UHF. Here is a Brand New version of the log periodic indoor antenna from Channel Master. It looks very promising. Highlights include long 110" cable and wall mounting option. UHF only. Ill try to find out more ASAP. 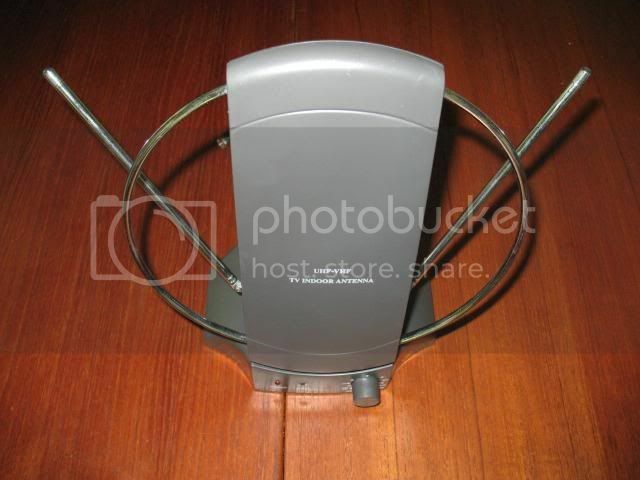 The CM-4040 indoor UHF/HDTV antenna offers excellent indoor UHF/HDTV reception. The Made in USA, Godar Model 1 is a nice log periodic UHF antenna with VHF dipoles. Its not amplified. It performed well and also is good for FM reception. The log periodic elements are encased in a low profile black plastic housing which is very sturdy and stable. The VHF telescoping Rabbit Ears can be extended if you need VHF reception or tucked away behind the low profile body for UHF only. Really nice setup. UHF and VHF and FM. Godar offers several antennas for VHF, UHF, and FM. They are especially known for their FM antennas. Check out their website here at godarusa.com. length (front to back housing bracket) 22"
depth (top to bottom of f-connector) 3.25"
Insertion loss: -1 +/1 1dB max. The Winegard Sharp Shooter 3000 is an excellent performing antenna. I really like this one with its pleasing wing style. Its fairly wide and is great with multipath thanks to it reflector screen which also helps with directionality and gain. This "scatter plane" reflector is removable for those who are better served by an omni directional antenna. This antenna seems to be pretty forgiving with placement as well. It has an integrated amplifier and and incorporates and FM Trap. VHF Hi performance is OK, VHF Lo is not so good. UHF is where it shines. One thing to note, it has a thin unshielded cable that is detachable which connects to the base of the unit. However, a thicker shielded cable does not fit in the notch in the plastic base which this cable exits...this probably however can be modified pretty easily. It works well at my location 45 miles out from the towers. VHF and UHF. 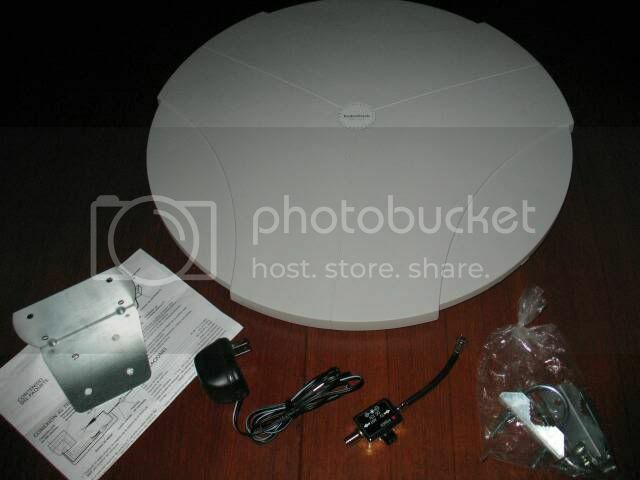 Winegards newest and best all-band indoor directional / bidirectional DTV/HDTV Antenna platform. Perfect for close range off-air reception in urban areas. Antenna weight .................................................. 1.5 lbs. Radio Shack 15-1892 with Remote - "The UFO"
aka "The Magic Mushroom," "The Starship Enterprise," and "The Frisbee"
This one, affectionately known as "The UFO," is a very interesting antenna. It gets great user reviews, and its performance is excellent. I really like this antenna. It is like a Smart Antenna but without the tuner interface, instead you operate it by remote control. Its automated, you can set it to move within its UFO disc, to adjust the antenna for individual stations that may be located in differing directions and also adjust the gain for each channel. Can be really handy for those whose broadcast towers are not all in one direction. 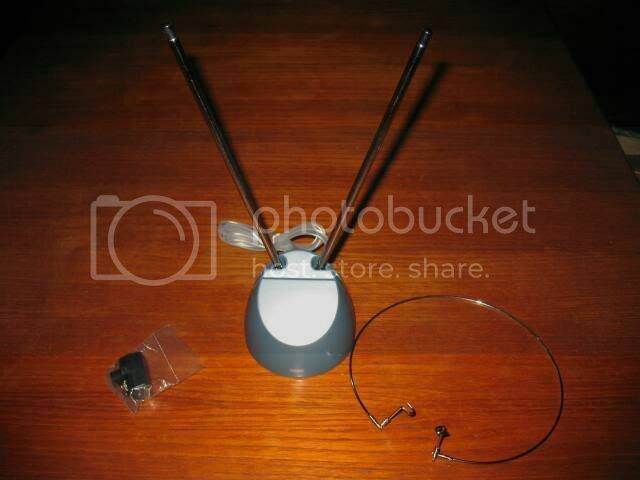 Comes with a remote to tune the antenna from the chair, to preset channel positions. This one can be extremely useful for those who are in reach of more than one broadcast market. Has Rabbit Ears for VHF which are limited in range of motion by the UHF disc. This one has an FM Trap. Amplified. VHF and UHF. Here is a link to my in depth review of the RS 1892 UFO's Features and Use on page 10 of this thread. Tune in to a better picture. This indoor antenna allows you to enjoy the best possible HDTV programming. Experience sharper HDTV picture quality with three amplifier gains (19dB, 15dB and 10dB), 330° rotation and 12 reception directions. The LCD displays the memory numbers, gain settings and direction for easy reference. The remote control works indoors or outdoors, up to 50 feet away. The Godar HD-3 is designed for Attic Install. An unsual design, it performed well, but was a bit finicky about placement. Check out the details at the Godar website here. The first in a series of compact, highly efficient antennas designed and optimized for 2009 frequencies associated with the DTV transition. High gain, and compact design offer excellent gain and impedance matching across the whole post 2009 DTV spectrum. The Clearstream is vastly superior to the existing compact antennas for receiving DTV signals. Good directivity at all frequencies with a peak gain of 8 dB. Provides substantial performance gains over commonly available compact antennas. Ive seen this one ranked high for performance among set top indoor antennas in a UK test and elsewhere. This one performs better than most Rabbit Ear and Loops on UHF. Wife friendly. UHF only. 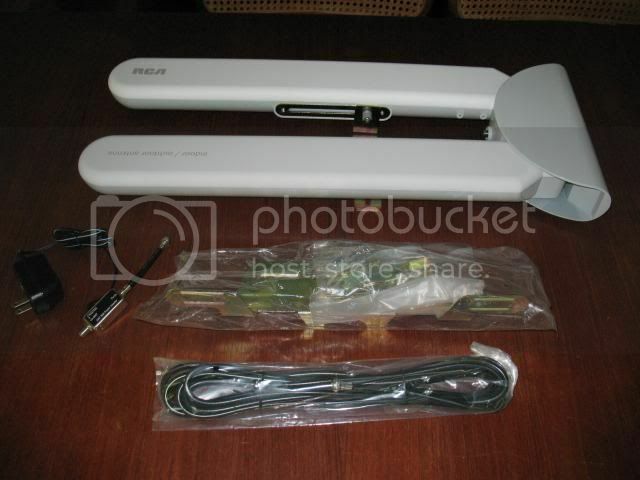 Here is one netizen's review of The Picture Frame Antenna. I bought this with very low expectations for our 19" kitchen LCD television. We had been using a Terk HDTVa but that was too large and just did not work that well anywhere in our kitchen. (It works great now that we moved it in our home theater room) Enter the lowly HDtv Picture Frame Antenna. I put it on the wall facing the direction of my towers and presto, all the local stations tuned right in! It really works amazingly well. One other important thing to note is that the included wooden frame is only average in quality. 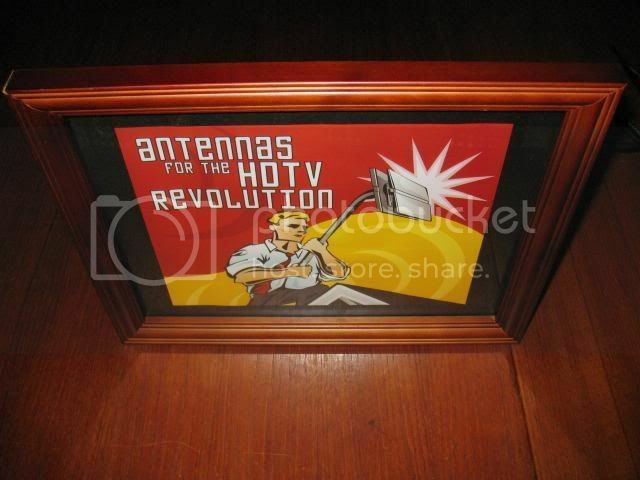 However, the antenna part of the frame (the back part) is completely removable and fits nicely into most 8x10 frames. So basically, you can customize it very easily to fit any room if the plain brown frame included does not match your style. I have mine in a wide silver and blue frame and it looks great. Dimensions: 9" high x 11" wide x 1" deep to hold an 8" x 10" photo. The RCA ANT1500 is better than most unamplified Rabbit Ear and Loops. It is a 10" square uhf panel that is 1/2" thick and is bi-directional in its gain pattern. Very sleek aesthetics. It has a permanently attached 6ft coax cable and a stainless steel bar that slides into the back to form a stand. There are also screw head mounts moulded and cut into the backside plastic as well as molded bumps to keep the unit off of the wall a bit when wall mounting. UHF and VHF. Optimized for HDTV reception with improved reception in both UHF and VHF bands. People seem love this popular little amplified antenna from user reviews, and they should. Expect excellent performance from this surprising little gem. And it is small. It comes with a thoughtful array of accessories, including 12ft or so of coax, screws and wall anchors, and u bolts. It has a pretty good internal amplifier. The mounting system is dynamite. 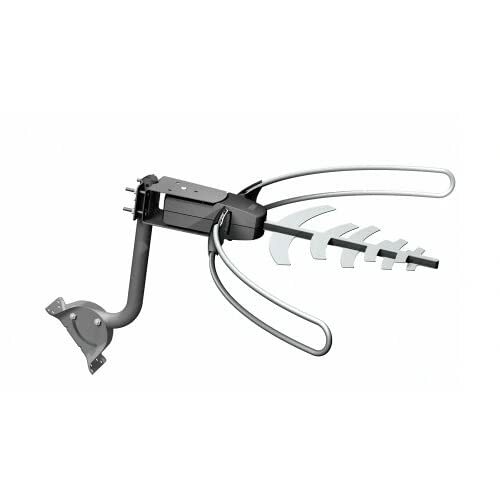 It's an single piece articulating arm made from quality materials, steel and ABS plastic, hefty for its size. The performance is what matters though, and this one performs. UHF only. This low-profile outdoor HDTV antenna is small enough in size that it's perfect for apartments or other areas where space is limited. 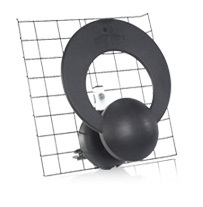 With its anti-UV coating and waterproof design this antenna will last for years. 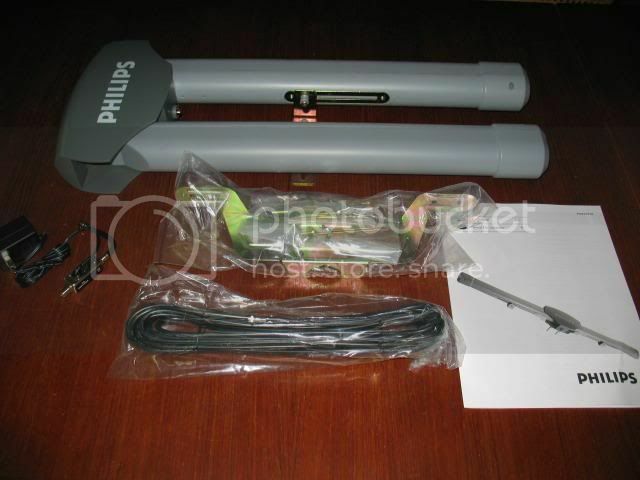 The Philips MANT940 antenna gets good user reviews and comes with a nice versatile solid mount, but a bit more complicated than the RS DA-5200 above, and a good assortment of accessories, like 20ft of coax cable, power injector. It is an amplified unit and offers very good performance. It offer some VHF Hi gain as well. UHF only. Easiest and best solution for urban/surburban UHF DTV (Digital TV) reception. 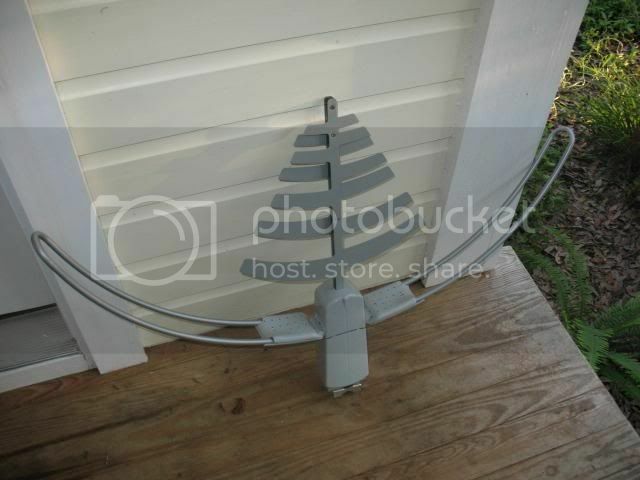 Perfect alternative to conventional outdoor antennas. Can be used indoors but designed for outdoor use(weather resistant). • Includes 20’ cable, power injector, power supply, and flexible mounting kit. Expect similar performace as the Philips MANT950 and Radio Shack DA-5200 above. This one has a similar gooseneck mount as the GE Futura Outdoor above. Expect similar performace as the Philips MANT950 and Radio Shack DA-5200 above. Nice looking mount. Winegard’s newest digital antenna. A true technological break-through and Innovations award winner. It’s the Best designed, Best-built, Best performing, Best looking, Easiest to install, Urban/metropolitan HDTV antenna available. Comes with J-Type Mast and Mount. Choose amplified model SS-2000 with built-in pre-amp when 25 miles from tower or further. Integrated 12dB gain amplifier across both UHF/VHF bands for better reception of digital HDTV channels. Winegard’s newest digital antenna. A true technological break-through and Innovations award winner. It’s the Best designed, Best-built, Best performing, Best looking, Easiest to install, Urban/metropolitan HDTV antenna available. An absolutely unique antenna with unlimited installation options. Fast and easy installation, Requiring no assembly. Because of its revolutionary design, it offers multiple mounting solutions for the best digital TV reception up to 50 miles out. Can be easily mounted using familiar DBS satellite antenna hardware, on Walls, Fascias, Roofs, Railings, Over a Satellite Dish, In the attic, On patios, Almost any place an installer needs to place it. The latest DTV set-top boxes show significant improvements in receiving DTV signals, particularly with respect to multipath echoes that can in some cases prevent successful reception. However, antenna characteristics are still an important part of the whole system. 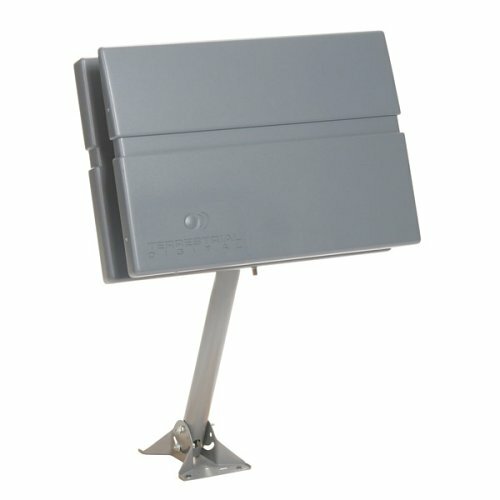 While difficult DTV reception can often be overcome using high gain and directional Yagi, logperiodic, or multi-element bow tie antennas, these tend to be expensive, large and suitable only for outdoors or attic mounting. There continues to be a need for small antennas optimized for DTV reception in urban environments, where signal strengths may be good but multipath is frequently a problem. At the Consumer Electronics Show this year the Winegard Company introduced a compact antenna specifically for DTV reception in urban locations but with the ability to receive signals over longer distances. The SS-2000 is built on the same platform as the SS-1000 “SquareShooter™” which the design won a CES Innovations Award in the Design and Engineering Showcase. With the integrated 12 dB amplifier, the new SS-2000 is much better suited for digital HD OFF-AIR reception than the SS-1000 because of the confusion caused by the difference in the UHF/VHF gain in the non-amplified version (SS-1000). Winegard says that the SquareShooter utilizes non-traditional electromagnetic antenna design for superior performance and, at the same time, provides that new contemporary “look and feel” desired by DTV/HDTV consumers, and states that it will outperform all but the largest high-band VHF/UHF directional antenna systems. Increased front-to-back ratio is obtained using a rear "scatter plane" to block signals from the back of the antenna. The good front-to-back ratio, absence of side lobes, and quite narrow acceptance angle should all contribute to excellent performance under multipath conditions. A key feature of the sinuous antenna is its equal sensitivity to signals of all polarizations – a technique suggested by others but not previously implemented in a consumer product. Field tests have shown that, as well as providing rejection of multipath echoes when receiving the main signal, the antenna allows reception in urban environments using a signal reflected from an adjacent building. The antenna has no internal preamplifier. However, Winegard has a new external preamp (HDP-269) for DTV with very uniform gain over the full band and excellent intermodulation performance, which is suggested for long feeder runs. The SquareShooter antenna element is produced using conductive ink that is screen-printed onto a polycarbonate base. The element is housed in an enclosure size 16” x 16” x 4” suitable for indoor or outdoor use, with a wide range of mounting options. 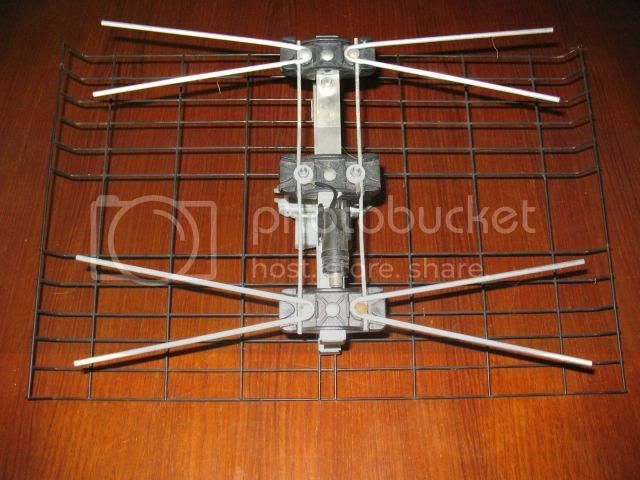 This antenna and the RCA ANT806 along with the Terk TV-55 are reviewed on this page. VHF and UHF. 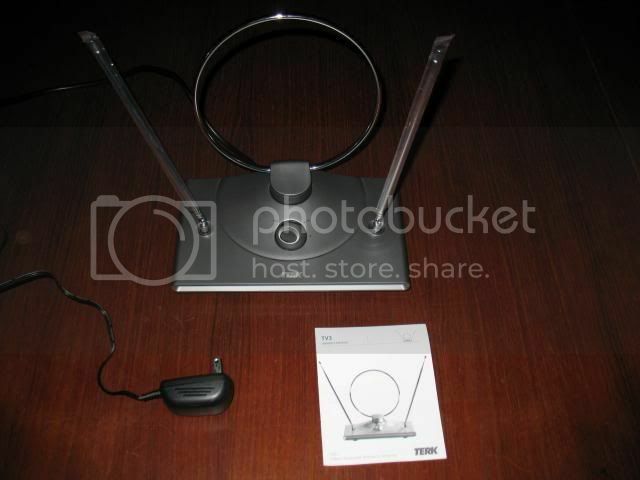 This antenna along with the Philips MANT950 and the Terk TV-55 are reviewed on this page. UHF and VHF. Sensar III shown mounted with Winegard’s 18 inch home satellite dish, on our DS-1111 mount meeting all wind load requirements for DIRECTV® and DISH Network® . This mount is designed for use with most home satellite mounts. DS-1111 shown here. This 21" diameter antenna for suburban/urban areas, along with RVs, trailers, and boats. The estimated range for the low-profile Omnidirectional Amplified TV Antenna is about 30-35 miles with good, open terrain. It's great for areas where TV stations are located in different directions, with its 360-degree reception there's no need for an antenna rotator. MS-2000 MetroStar, for homes, apartments, mobile homes, condos, townhouses, offices; excellent VHF/UHF reception. Omnidirectional for install-&-forget convenience; no rotator system needed, built-in preamplifier to boost signal strength—up to six times the received signal on VHF, nine times on UHF. Easy to install with hand tools on any antenna mast or light-duty antenna mount. 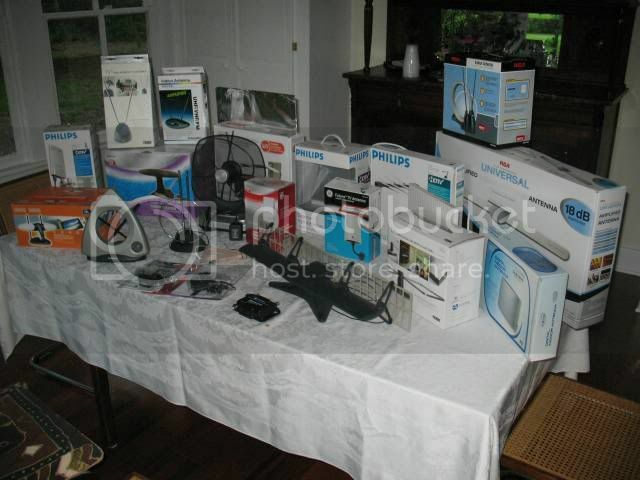 Includes antenna, power supply, 50 75 ohm coaxl cable, 6 TV set cable, hardware, mounting bracket. Good companion for digital satellite systems. 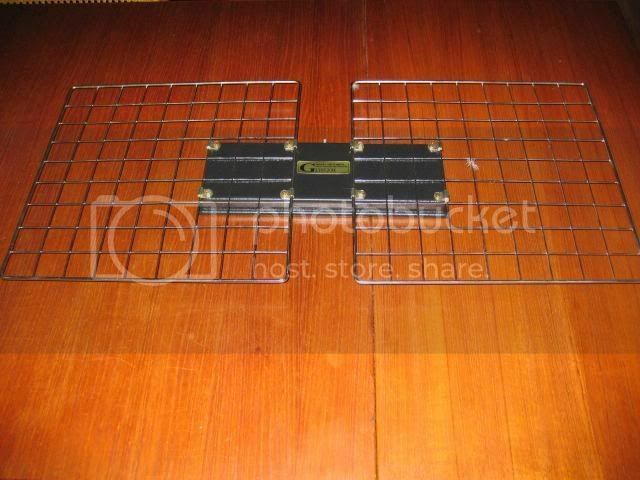 Amplifier Gain.................................VHF-15.5 dB avg. UHF 19.5dB avg. Some very informative articles, reviews, tests, shootouts, and websites. I highly recommend checking these out. Lots of great information on this website. The list of antennas below is hotlinked to pages which address each antenna individually with comments charts and graphs. The navigation on that site isnt the best, here is a link to the HDTV Primer home page which contains all kinds of HDTV information, antenna and otherwise. This one is a little less intimidating for newbies. Here is Fox Charlotte's Digital Dude on HDTV antennas. Humorous and informative. Digital Dude Video: Antenna Myths Dispelled! Consumer Reports has a nice friendly guide to Televisioin Issues. These three pages from the HDTVexpert contain shootouts of various models of indoor antennas. Testing equipment is used to ascertain relative performance. Very informative, check out his home page too, where he discusses Broadcast issues and Reviews equipment, such a Converter Boxes, Tuners, Antennas, and Signal Analyzers. WINEGARD’S SS-1000 SQUARE SHOOTER: A BETTER MOUSETRAP? This is the WALB News 10 report which includes information from the presentation at the Spring 2008 Broadcast Engineering Conference. I havent been able to get more data on this....but there is good stuff present in this WALB report non the less. The Kyes Antenna site is almost as informatioin loaded as the HDTVprimer site. Nice commentary on How to Get the Most out of Rabbit Ears, Common TV and FM Antenna Types, Amplifiers: The Good, The Bad, and The Ugly, and much more. Other good sites for antenna reviews. Amazon.com has quite a few reviews at their site under individual antenna headings. 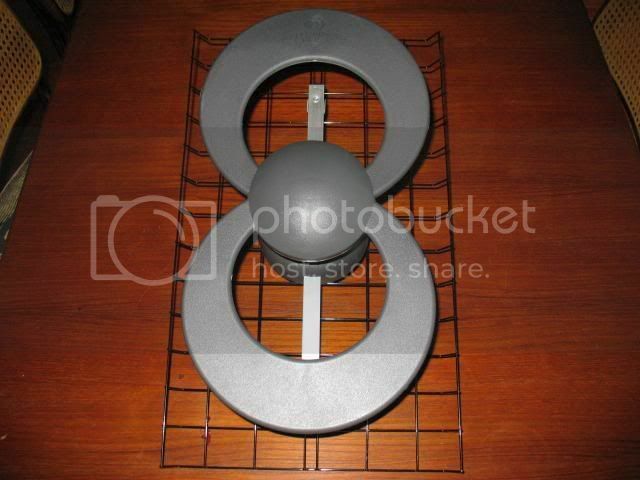 HDTV Antenna Labs has a good review site with rankings as well. This AVS subforum has city by city threads where locals discuss the local reception environment and issues, and is a good place to find what antennas, others in your area and situation have found success with. Find your area in the list and click....then read, search, join the discussion, and post questions. Here is the thread about rotors, antennas, boosters, amplifiers, splitters, attenuators, masts, towers, grouding blocks, and all kinds of antenna accessories. The first page has lots of good links to information on the web. Join the discussion and ask questions. This is The Official AVS Antenna Topic! Join the discussion and ask questions. Lots of antenna gurus frequent this thread. The Official AVS Antenna Topic! If you are having trouble with your current antenna. You can give this homebrew solution a try. All you need is some cardboard and aluminum foil. Lets say you have a basic unamplified RE & Loop antenna....and you are struggling to bring in a couple of UHF stations. Cut out a piece of a sturdy coardboard box, the sturdier the better, apporximately 4" wider on all sides as the loop. Then wrap in aluminum foil. Now turn your loop so that one side is facing the towers you are trying to reach.....and position your new homebrew reflector screen about 4" behind the loop. Youve just made your bi-directional UHF loop into a directional antenna, increasing forward gain. Move the reflector screen forward and backwards from the 4" position until you find the sweet spot. 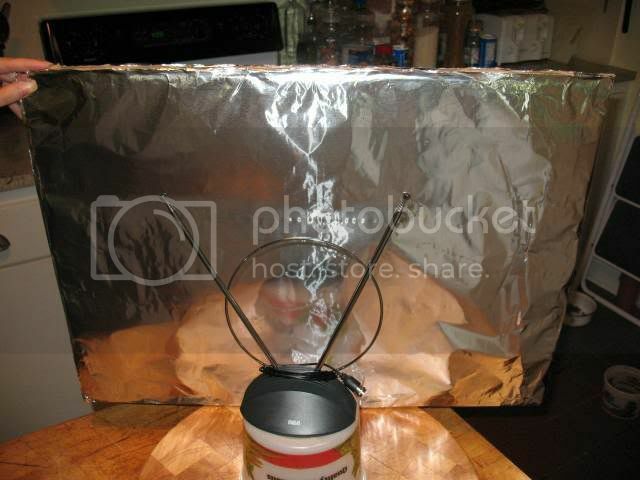 Also this reflector can be used to shield your antenna from electrical noise and interference from other home devices like computers. Here is a pic to help vizualize the reflector. This one is much larger than is necessary for the antenna in the picture. This is the legendary RS Double Bow. Now discontinued. Some people mistake it for art! 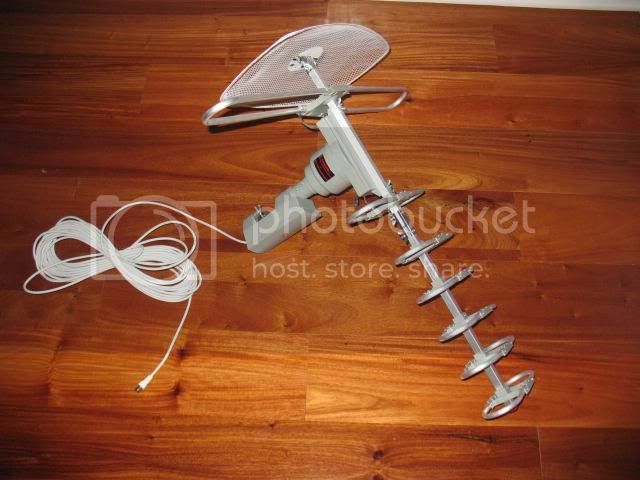 Great little antenna with reflector and feet for standing up. 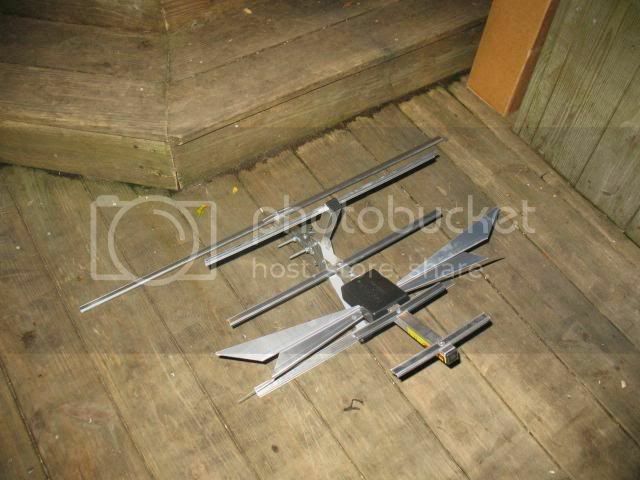 However its bows are a bit too small for the best UHF performance. The DB2 and CM4220 surpass it with their larger bow ties. Still an excellent performer....even better if you add an amplifier. UHF only. EDIT: This one has made a reappearance as the Channel Master 4149, which is still available for sale, online. This is the legendary RS 1862. Now discontinued. 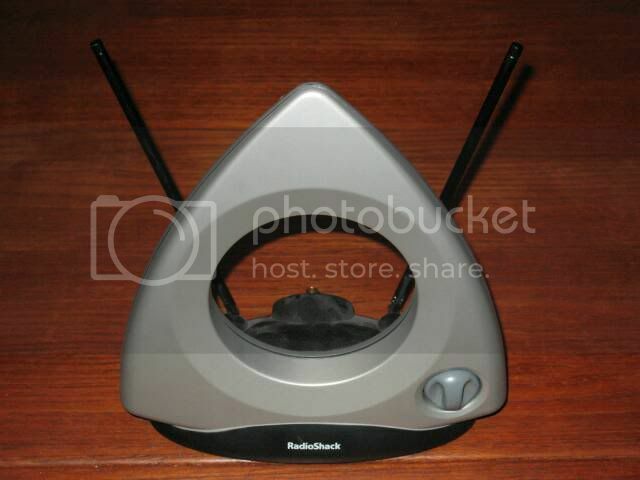 "The Holy Grail of Indoor Antennas." Amplified. UHF and VHF. This is the legendary RS 1880. Now discontinued. This one was available after the 1862 was discontinued. Besides the silver accents and the green power on indicator light (previously red), the most important difference between the 2 is a slightly lower gain amplifier on this newer version. I have 2 of these. They are pretty reliable at 45 miles from the towers at my location. UHF and VHF. Samsung made a quick entrance and exit in the TV antenna marketplace. It had a couple of models out. Not much info out on them, but this one looks promising as a Silver Sensor clone. Looks like the wider base will make them more stable, a thoughtful design improvement. Looks like they might be adjustable at the arm/base interface which would also be welcome. Has a Star Trek aesthetic look to it. UHF only. Addendum: This one may have been discontinued and forgotten. LOL! This one recieves COLOR transmissions! LOL! My DISH installer put the gs1100 on my roof. WHY?? The 622 is a digital only receiver. It failed many times to pick up my locals at only 21 miles. I compared it against my Youtube on the garage TV. No comparison. The gs- 1100 went out with the trash. Thanks for the input spokybob. Like all antennas, YMMV. Im sure that we will have many that disagree, clarify, and specify. At least Im hoping. I hope others share some of their favorites, too. My friend has one on his camper out on "the land," which is 45 miles from the towers and he gets good signals on analog. 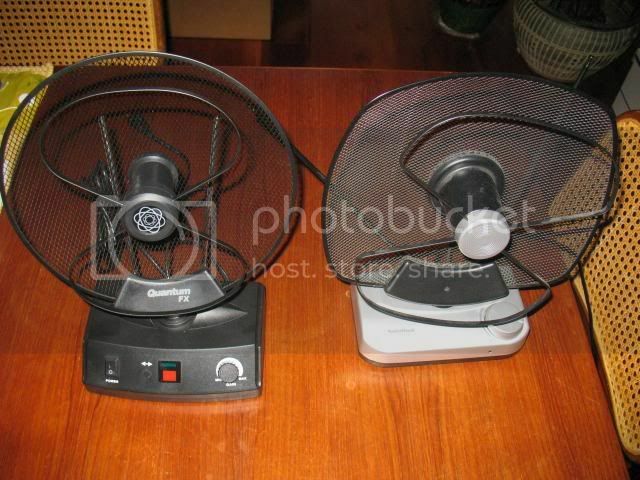 I dont know if its the GS-2200(amplified version) or the GS-1100, though. I was pretty impressed though. But I do know that these are bipolar on vhf and highly directional on uhf as the charts show, perhaps the install was bad. No doubt the Quad Bow Ties rock. Those triple threat antennas like the MANT510, how do you aim 'em? Two dipoles plus a UHF loop has got to be a problem. 3x360. That Terk one...has anyone actually used that for both UHF and VHF at the same time? The status of the dipoles definitely influences UHF reception. I recently drove several streets in the neighborhood in search of someone with a 4228 on the roof, but couldn't find one. I'll try again. Thanks for the review EV. Those triple threat antennas like the MANT510, how do you aim 'em? Like a classic Rabbit Ears and Loop. That Terk one...has anyone actually used that for both UHF and VHF at the same time? I've been aiming, and re-aiming, a 510 for over a year and a half. It can do things the classic dipoles and bowtie can't. The uhf square can be pointed up or down for example. One of my latest crazy ideas was to point one of the dipoles down towards the patio hoping for a rebound. It helped. I would have thought some folks would already have experience trying to get DTV via both vhf & uhf. In the bay area channel 12 is being used by San Jose's KNTV. It's too far away for me. I'll have a shot next year when 9 & 10 will be used in Sacto. All my digital channels are on UHF right now. Ive got PBS moving to VHF HI next year, channel 7. Ive got a MANT510 on the way, to experiment with. No, but I've heard it's pretty good. I might get one and test it out with the half dozen others I have here. edit: Do I note a touch of sarcasm in that post Rammitinski? Mostly finished, still some cleaning up to do and draft improvements. Please let me know if you liked my review and found it useful. 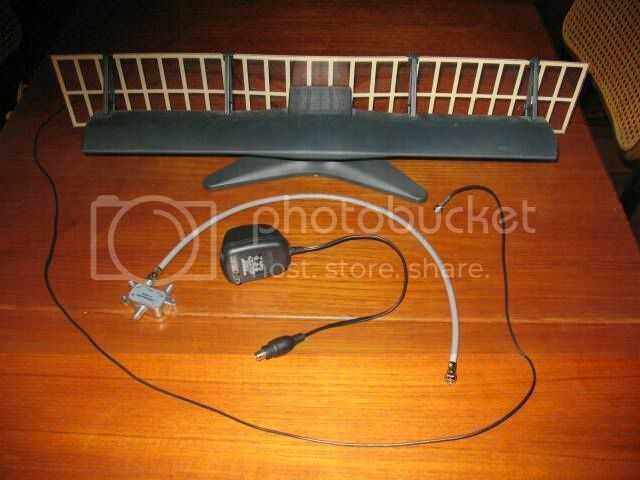 Superior antenna for use indoors . . . I agree. I am in a heavily wooded area (and in a hollow to boot) about 26 miles from the towers. My location has been described as a "worst case scenario". No. I'm being 100% sincere. I believe there were some positive comments about it here a couple of years back. 3 x 360, that's 1080. I'm not making this stuff up. 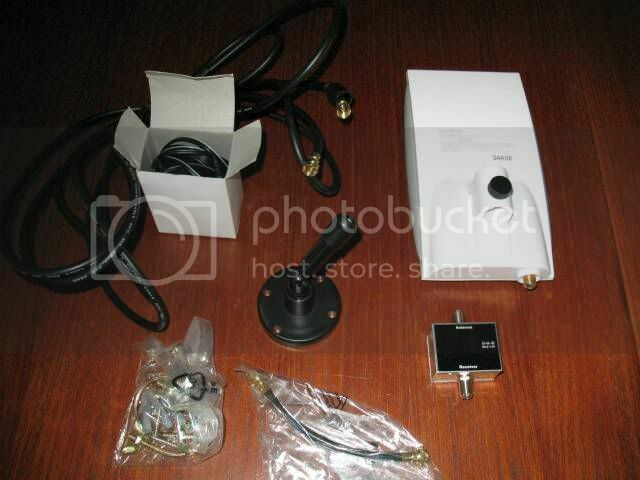 Any indoor antenna with dipoles and a UHF will have similar problems to the MANT 510. I like the Silver Sensor because it's only got one 360 to deal with, but it has to work. Sadly, I doubt my Silver Sensors will bring in channels 9 & 10 next year. Another contribution to the art of aiming the triple threat antenna: unlike the classic dipole configuration, the left and right dipole need not be pointed in directions opposite to each other. The dipole towards the patio helped. Aiming the UHF first and the other dipole after towards the patio hurt reception. Without patience, a lot of people will elect to dropkick. I'm not saying I won't eventually. Wow, this is the thread I've been looking for. We just got a digital converter. 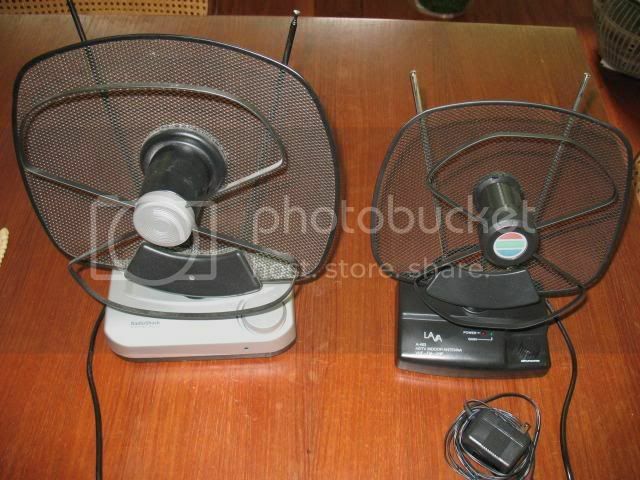 I wish I could snag those old Radio Shack 15-1862 or 15-1880 models. I've heard so many GREAT things about them. Currently, we're just using an old junk rabbit ear / uhf loop combo. It works way better than the amplified RCA ANT1251 we borrowed from a neighbor (no wonder he wasn't using it). We're still getting some stuttering on a couple stations with transmitters about 20 miles away though. I'd love to get an amplified antenna at a LOW cost that'll help shore those up. Anyone have any pros / cons of the Philips MANT410 vs the MANT510 model? They're similarly priced at Wal-Mart. Does the oval vs. rectangle UHF antenna matter? While I agree this is a very valuable thread (possible sticky?) I also have to say what spokybob's hinted at: you can do much better for less money making a simple bow-tie array like those described in the antenna making thread. This thread starts with a basic UHF-high design, but quickly expands to some real interesting options. Most aren't very "pretty" until you see the signal they bring in, but they also have enough gain to work from a closet if you don't like them as wall decorations (mine's in the attic).